The Avatar-themed Disney World attraction first announced in 2011 began construction this month, part of an estimated $800 million renovation and expansion of the park’s Animal Kingdom. The Animal Kingdom work is a personal priority of Tom Staggs, chairman of Disney’s global theme-park division reports the Orlando Sentinel. Staggs helped negotiate Disney’s Avatar licensing deal with filmmaker James Cameron and 20th Century Fox. The park’s struggle to keep guests for a full day has become a hard-to-ignore flaw because it has exacerbated overcrowding problems elsewhere at Disney World. Many of the visitors checking out of Animal Kingdom in midafternoon head for the Magic Kingdom, which is bursting with more than 17 million annual visitors, or the Downtown Disney retail area, which struggles with parking shortages in the evenings. 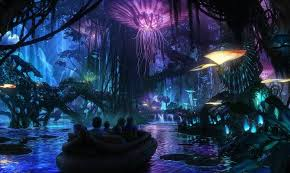 It’s hoped the luminescent night-time environment shown in Avatar will translate to something that keeps tourists in Animal Kingdom after dark. The Avatar area will open in 2017, replete with floating mountains, lush jungle scenery and a ride on a “banshee,” the flying predator seen in the movie. This entry was posted in Like Show Business and tagged Avatar, Disney, James Cameron by Mike Glyer. Bookmark the permalink. One movie and they make one entire quarter of a theme park over? And what’s in Avatar Land anyway except a lot of oversized tropical flowers? Maybe Disney should issue the visitors with a hit of acid before entering? Well, Disney has done that before, as well as turned rides into movies. I just wonder if this theme park would make me ill, just like the 3D graphics in the film did.